The intuitive 9 Series solid state controller provides continuous monitoring of both temperature and humidity, providing accurate control over the internal environment of the cabinet, resulting in better food quality. Actual temperature and relative humidity are measured, displayed, and controlled. held at the desired temperature. 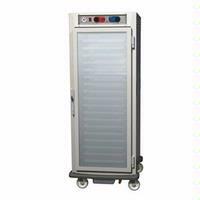 Low water sensor and low temperature alarm assure cabinet is performing safely. The C5 9 Series controller prioritizes heat generation over humidity generation assuring the cabinet holds food at the desired temperature, promoting food safety. Universal slides hold 18"x26" sheet pans or 12"x20" steam table pans on adjustable 1-1/2" increments. Four casters with 5" donut neoprene wheel, double ball bearing swivel, ball bearing axle, nickel plated, two with brake. Universal Slides: Universal wire slides 1/4" diameter nickel-chrome wire adjustable on 1-1/2" increments.